Reviewing my last few posts, one can't help but notice something: almost everything is a picture from Maine, and this is an Ohio nature blog. When I set out in the blogging world, I thought I would do more reporting on what was happening in Ohio nature. In a former life, I did report on my own natural findings in Ohio considerably, back before Megan and I moved. You see, we lived only a minute walk from the Olentangy River corridor, which offered a myriad of natural photographic opportunities. It also didn't hurt that my neighbor had been feeding birds there for decades, and there were plenty of photographic opportunities right from my living room. Now Megan and I now live in the middle of suburbia, less than a mile from that very same river, yet things are quite different. Preparing for a baby, trying to attract birds to our yard, removing wall paper and painting, and setting up a house to be the way we want it- all these things-have sucked up my time. And I'm fine with that. I just have to come up with new and creative ways to find nature around my new settings. And I have, however, many of these findings never made it here because I've been fully enveloped in the joys of home ownership. Slowly but surely, the neighbors are getting to know us. And maybe they think I'm a little weird having my camera out all the time, but I have built up a reputation, at least to one person, that I like bugs. 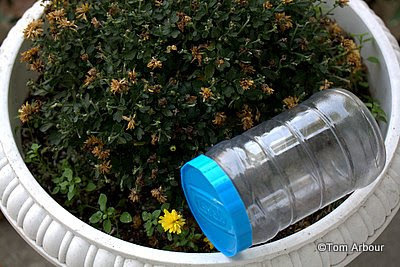 Megan and I were greeted with this plastic container lying in our mum urn in early November. As I glanced through the plastic, the huge bug came into focus. Ah ha, I thought to myself, a "wheel bug". Our neighbor Nancy must have placed the jar on our porch. The previously summer, while I was outside taking pictures of moths on the lamp post, she had stopped me and wondered what the heck I was doing. She told me about a really big weird looking bug, and I suggested to her that it might be a wheel bug. Who knows if what she actually saw was a wheel bug, but what she had captured and placed into this plastic container was most definitely the creature I had described to her. I was excited- Megan and I had seen a wheel bug two years prior during one of our trips to Slate Run Metropark, but back then, I hadn't yet bought the Canon efs 60 mm macro lens. 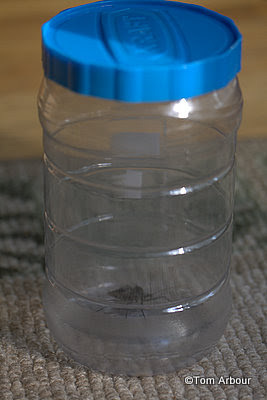 I was excited to take the bug out of the jar, carefully I might add, ensuring I didn't receive its nasty and painful bite. 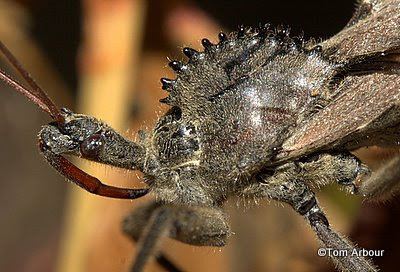 "The Wheel bug (Arilus cristatus), in the family Reduviidae, is one of the largest terrestrial true bugs in North America, being up to 1 1/2 inches, or 38 mm, in length; it is the only member of its genus. A characteristic structure is the wheel-shaped pronotal armour. They are predators upon soft-bodied insects such as caterpillars, japanese beetles, etc., which they pierce with their beak and inject salivary fluids that dissolve soft tissue. 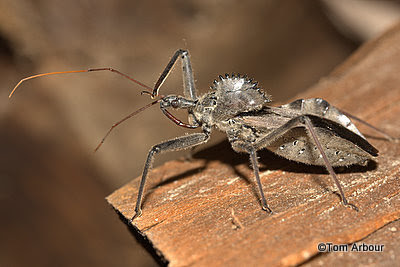 Because most of their prey are pests, wheel bugs are considered beneficial insects, although they can inflict a painful bite if handled carelessly." I wasn't going to be careless this time. This is a fascinating creature, I couldn't help taking numerous pictures from about every angle that I could get a shot. Doesn't that red piercing mouth part look formidable? I'm just glad that I don't have to worry about catching food with a giant piercing mouth part. So there we go. The fascinating wheel bug, captured in digits (we can't say "on film" anymore) right here in Ohio. I'm working on my photography skills (have a loooong way to go), and this is VERY inspiring. Though it also reminds me of the limitations of my Rebel kit lens. Congratulations on expecting! Our daughter is 10 months now... pretty amazing time. Hello Tom. Mary send me your link as she knows I am also a mad bug photographer and thought I would enjoy this story of yours and I did!! LOL!! I have had workers and strangers bring me bugs of all kinds in matchboxes, paperbags and bottles. The neighbours think I am crazy and lock up their children when I am out with my camera!! LOL!! Well okay, not quite, but almost!! LOL!! They see me peering under leaves and crawling under bushes and shake their heads at that "poor old mad woman"!! LOL!! But I enjoy finding and photographing them and it keeps me out of mischief. You have a great blog here!! Good luck with your bug hunting!! I just did one on an Assassin Bug and a Squash bug which is similar to your Wheel bug if you are interested in going to look. 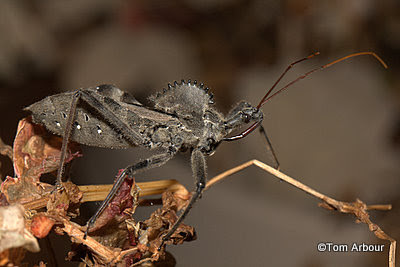 Great shots of the wheel bug--thanks for sharing the Wiki info, as well. Nice to see a beneficial bug now & again, especially w/o it's angry red piercer sticking my skin! Yeesh! tom: Oh what a wondrous creature. 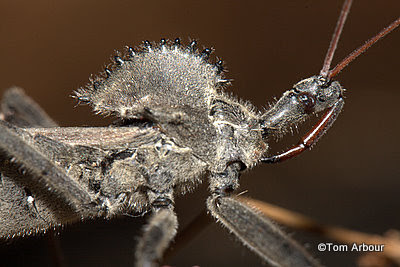 It looks like a cross between a Stegosaurus and a backward wasp with that stinger mouth. I haven't seen one and don't know I want to. You've got me thinking, Tom! We have alot of insects here in the woods that look like this, I'm not sure it has the wheel armour on it, though. I've never looked that close. Are these rare? Are my chances slim in coming across one? These are great photos... ugly, but great shots! Thanks Mary for spreading the word about my wheel bug. This will only help me keep up my bug loving reputation! Hi Kay- Buy the Canon Efs 50 1.8 II for 70 bucks at B & H. It won't do macro's (without an extension tube) but it is a great lens for pictures of "things" including portraits. Amazing how we are all grown up, isn't it? It seems like we were just sitting in the band room playing our trombones to some cheesy christmas music tunes arranged by Brian Monroe. You should check out a book called Closeups in Nature by John Shaw. There are ways you can get your kit lens to close focus without buying a dedicated macro. Hi Joan- I'm always interested in seeing bug images. Thanks for stopping by. Isn't it fun to have people bring things to you? It makes it so easy sometimes. Hi Lana- I bet these creatures get down to Louisiana. Be on the lookout. Tom- yes, that is a great comparison. It is quite prehistoric looking. I really enjoyed your post on the bridges today. Thanks Spooky- I think that the wheel bugs are not rare, but I've only seen two in the past two years. I think it just takes a little bit of luck. 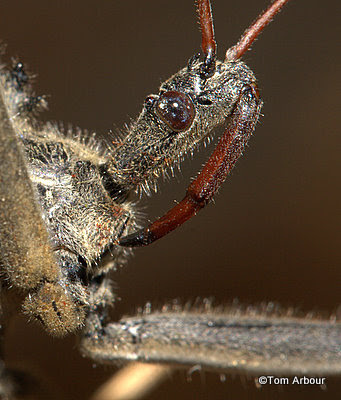 There are other types of bugs called assassin bugs that are what you may be seeing. I love Wheel Bugs! I have a post on my blog about them from the summer. I am a crazy one who will handle them, but I keep a careful watch on the business end, the stylet. Incredible, clear macro shots! Good thing you got that great lens! I've never seen one of those "Wheel Bugs" and no offense, but I really don't want to! On your blog, he is fascinating! Thanks for a most interesting post! Congrats on expecting a baby! Janet- Yes, you are very brave, holding the stylet like that. Fortunately we have fingernails. Hi Linda- Wheel bugs are fascinating and you should definitely keep your eye out for them. The baby will be here soon- thank you. I just got bit by a wheelbug in Plant City, Florida. I think it was just a nymph as it did not have the wheel on the back yet. It was not too painful but I think I brushed it off before it could do much. It sure is a scarry looking insect with that dagger of a fang it has fo perice you with. I enjoyed your pictures, but I hope I don't see or get bit by anymore wheelbugs! No doubt- Glad your bite wasn't as bad as it could be. Last year was the first I had seen wheel bugs around my house...and being an avid gardener and former county extension agent I thought it might be a type of assassin bug. 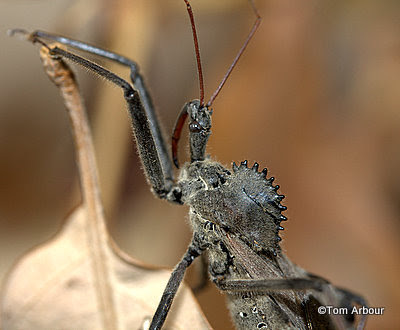 I was fascinated when I read about the wheel bug but also creeped out--which is rare for me. I have been wondering all season if a new generation would show up and sure enough last week I found 4 nymphs....then just this evening, an adult hiding in a helianthus flower. Now I don't want to go into my garden. One reference I read said the bite was so painful that the recipient considered cutting his hand off or doing himself in...this does not sound fun! I have two in a bug jar. In a matter of hours, one nymph changed into an adult which was half again as big and had the cog wheel--amazing how there could be such a drastic change in look and size. Gotta love nature! He cannibalized the other nymph. I'm not a big fan of assassin bugs. They like to lie in wait in flowers and ambush honey bees when they approach to collect nectar. It's a sad sight. Honey bees are such beautiful, fascinating and industrious creatures. 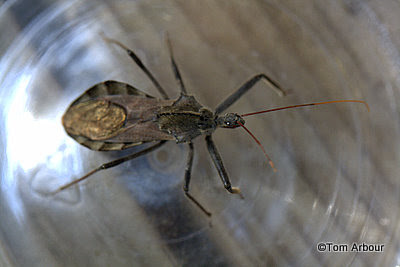 well i live in Baltimore city, and i just caught a wheel bug today, and it's really big. I'm going to keep it in a small fish tank and feed it different bugs lol. I have so many around my house! I am so afraid to even go out my door at this point. One day one landed on my arm but I brushed it off so fast and stepped on it and nearly feel back doing so. Why would this bug fly on me? and why are they hanging around my back door? Please Help me know why? If they would just go about there thing and eat bugs ...fine! But stay away from me!!! I am so afraid of being bit...also my dog loves to be in the backyard so I fear for her too! Is there something I can do to get rid of them? What are they attacked to. Perfume? Cigarettes? Beer? Please Help! Are you sure that you don't have stinkbugs? They're much more common and hang out in and around homes. They're harmless.